I Came, I Saw, I Coffeed Online Dating: Why Didn’t He Call Me Back? What Goes Through a Man’s Mind on the First Meet? Impressions from a Man Who Had Over 350 First Meetups. I was newly singled after an unwanted divorce and retired early, so I had time on my hands to find a girlfriend. I didn’t want to be alone, and hadn’t dated in years. I was eager to meet a woman, and became discouraged trying to find someone to be your love, your best trusted friend, a confidant and companion — a very difficult task. Seeing my low spirits to get on with searching to find a woman, a good friend simply told me dating is “Just a game of numbers — the more ladies you meet, the better decision you’ll make.” So, I ventured into the field of online dating and over three years met over 350 ladies. Many women asked me what goes through a man’s mind when he meets a woman. In this book I spell out my thoughts about the women I met, her walk, her appearance, demeanour, clothes, habits, figure, etc. in detail. This book was different to the others that I’ve read in the past, mainly because it is a real life report of the authors online dating experiences. In each chapter he writes about a different date, therefore the plot is as simple as that. I found it quite interesting to read about the experiences of a man doing online dating, i.e. get a look at the other side of the table. Bruce was already retired when he started dating, and it was interesting to discover that dating is always the same, no matter how old you are. Unfortunately, after a few chapters it started to get repetitively boring, because, although Bruce dated several different women, every date felt like the same experience. 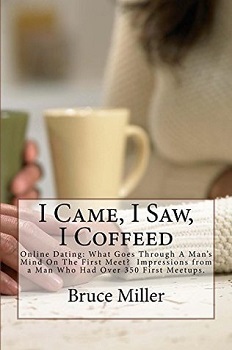 On the other hand, this book is a fast read and certainly will be interesting for people who are currently using an online dating platform, because it may feel good to know that a lot of people are struggling with doing dates. Therefore, there is always kind of a fear to end up alone, but this book shows that it hasn’t to be like that. I would recommend to read this book maybe on a train journey on the way to a date. 🙂 It may help as a reminder to simply be yourself and not put on an act and try to be someone else, just to impress your date.